The lovely girls at Noir invited me down to their salon for some beauty treatments before I headed off to Marbella! I must admit, I've never been much of a salon girl, I tend to get my eyebrows threaded (sometimes) but other than that it's fair to say I'm quite the beauty treatment virgin. which treatments I had done & of course, the end results! 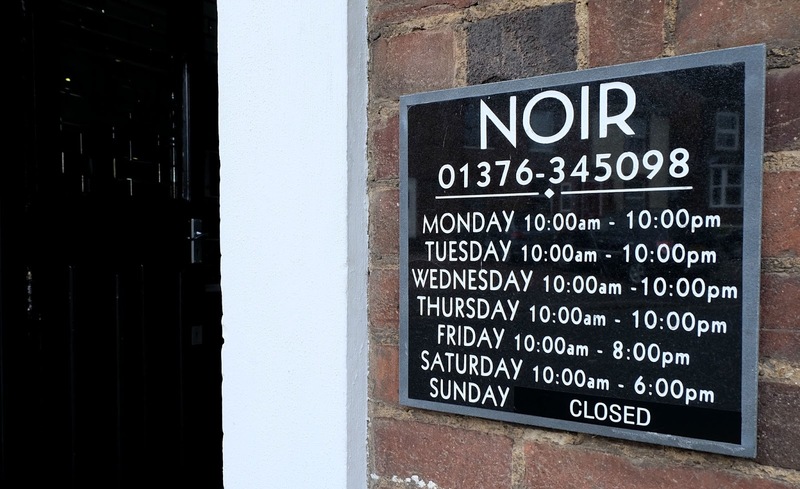 The NOIR salon in Braintree (Essex) opened their doors to the passionate beauty heads of Essex just over a year ago. Former fashion stylist Hannah Jones, owns & runs the salon with help from Emily Pritchard on the salon reception & covers the social media channels. The salon stands out from all of the other salons in town. The gorgeous interior is super eye catching (even from the outside!) 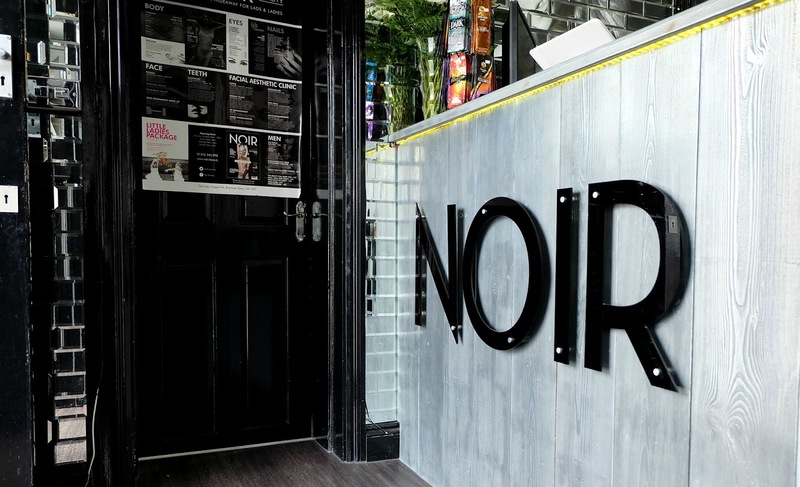 NOIR went for a very noir theme indeed, keeping the salon style very chic and monochrome. I LOVED the mirrored tiled walls inside the salon- there's a whole wall which is full of them. I've never actually seen them before coming to Noir. With the mirrored tiles and the black brick effect walls this gave the salon an ultra glam AND industrial feel which was super refreshing and unique to see. 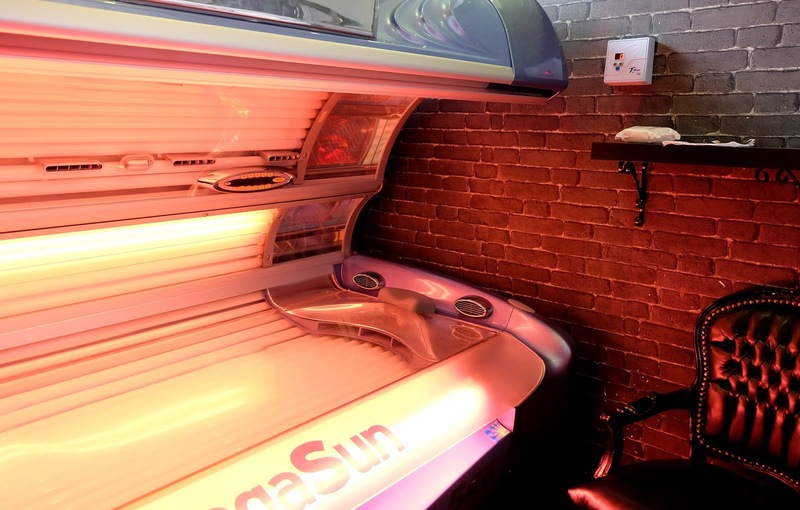 Sun beds. Uh. A touchy subject indeed. I have always been against the idea of a sunbed. I had never ever tried one until last month, I didn't actually know what to do in one?! The thought of sitting in a hot machine is quite bizarre right? Luckily the lovely Emily showed me the ways of what to do and how to use it really. I suffer with dermatitis and eczema which can flare up pretty badly over my body so I didn't know if a sunbed would do this any good- BUT I was informed that NOIR have a few clients that suffer as badly as I and use the beds on a regular basis and have found that the UV light has actually helped keep the flares on the lowdown. NOIR has a special skin lotion which is suitable for sensitive skin, so I was super keen to try this out before hitting a bed. Emily set me up with the cream and popped me on their hottest lay down bed. I was given 6 minutes on the clock with an additional 5 minutes beforehand to cream up & prepare myself. The music was an awesome addition on the beds, it was a great volume and a great choice of up beat music. I surprisingly didn't find the 6 minutes too much, I thought it was fine, I LOVED the heat. I felt real good when I came off of the bed, myself and Emily had even noticed the colour straight away on my face. I had a 8 minute bed the following day out of my hour course, since then I haven't been around in Braintree to go back as of yet! but the 14 minutes I had in total gave me a fab little pre-holiday glow which I really enjoyed. Unfortunately I can now see how people can get addicted to these beds since they are so affordable and accessible, it was a lovely treatment and I would occasionally use this again before future holidays, but I wouldn't abuse using them too much at all. P.s my skin was absolutely fine with using these beds which I was SO pleased about since I was rather worried- the cream was extremely nourishing and left me feeling (& smelling) really good. I was keen to try out some of the amazing treatments I had seen results from on NOIR's social channels. The sculptured acrylic nails was a must have for me. I had never had any kind of false nail before, and I wanted to see ultra girly with pretty nails for the trip away with Mark Hill. NOIR has one nail technician, Jenny Jewitt, and my goodness is she fabulous. I've never seen a nail technician like Jenny who gives her all into achieving your desired look. You have probably seen my nails on my Instagram (a lot!) Jenny also specialises in nail art as you can see, so many people didn't believe it was all hand done nail art because it was SO well done. Overall the nail process took 2.5-3 hours. I didn't really know what time to expect since it was my first time, but I walked away with with such gorgeous nails I was thrilled. You know when you're so damn pleased with something and just have to keep looking at them?! Yep, that was me, for a good week! So how did I find getting on with pieces of plastic on the end of my finger tips? It was weird for the first 4 or so days or getting used to it I gotta admit. They're still on now after 3 weeks after a few dropping off and I'm getting on with the length just fine. The gel colour on them did not budge at all! not even a small chip. The painting was SO well done. Nails are so much more attractive when they're all lengthy and pretty right? I love having falsies. Will I be getting them topped up? No, I don't think so. I think they're fab for holidays, but for day to day productivity I think it's best I have a wee break from them. Jenny recommended the perfect size for my nails since it was my first time having them, and I personally wouldn't had gone any longer or shorter, the sizing was perfect. 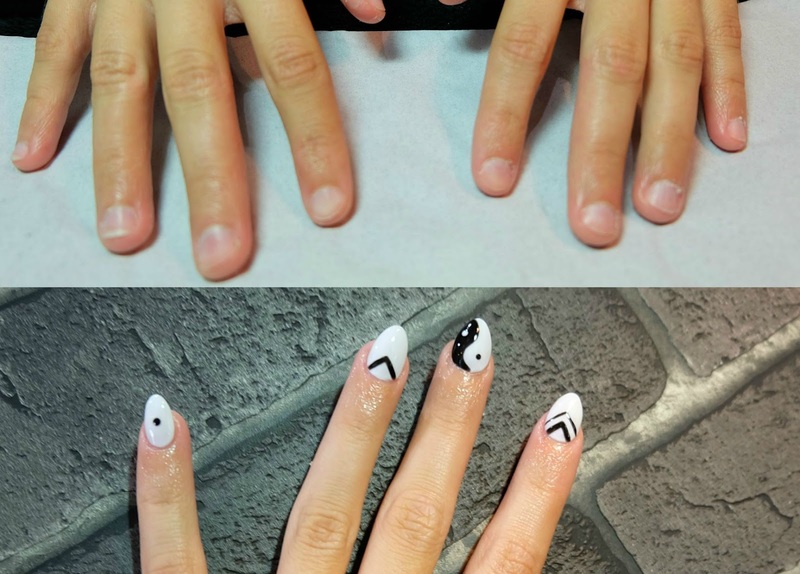 Jenny also went through the different types of nail shapings for my nails from recent customer pictures, I had my heart set on the almond shape. I LOVE that shape on nails so much. Overall I was absolutely thrilled with my nails, Jenny went above and beyond for me, my satisfaction levels were at an all time high with these gorgeous new nails. Brows brows brows! if anyone knew me well enough they know I love to have my eyebrows done. I had only ever had HD brows done once, and that was about 4 years ago by someone at Amy Child's salon, long story short the brow technician really sucked, and it was expensive. So I was looking to try out this treatment again. 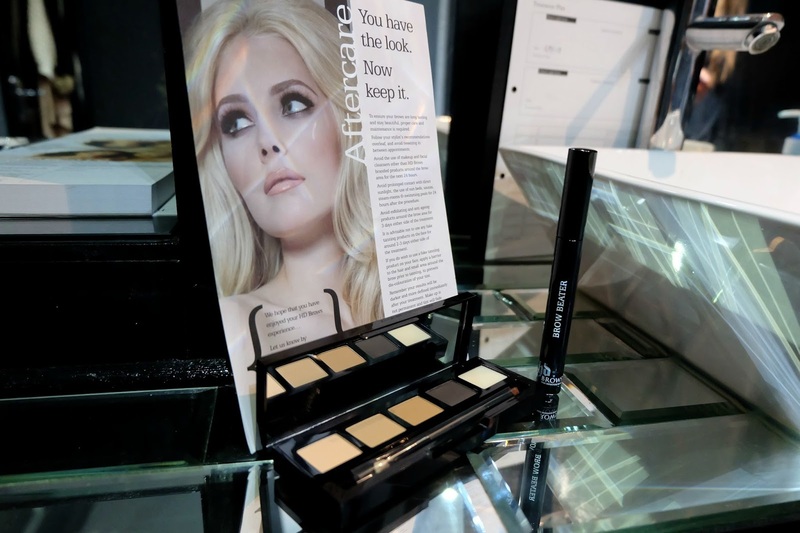 Elisha, NOIR's brow technician, caught my eye with the fabulous brow results she creates for her clients. I had seen many before and after pictures on NOIR's Facebook page and they looked really well done. I had left my brows to grow for a good 2-3 weeks (yep, they were super hairy!) and let Elisha work her magic on them! Elisha fully analyzes your face shape part of the 7 step process. I usually get my brows threaded but the HD brow process involves both threading and waxing which is fab. This means you'll be getting super precise & neat results. Part of the face analyzation step, measuring plays a huge part. Elisha will measure your brows so they're along the same measurement (remember, they're sisters, NOT twins!) so they will never be completely identical with this process - but Elisha did a frigging great job with mine! I highly recommend visiting Elisha for this treatment. It's so fab when you can be relaxed around your beautician, Elisha was so lovely to genuinely chat too whilst having my treatment - Elisha taught me lots about the procedure since I had lots of general questions about each of the steps and Elisha never was unsure, she always had an answer and her passionate opinion. 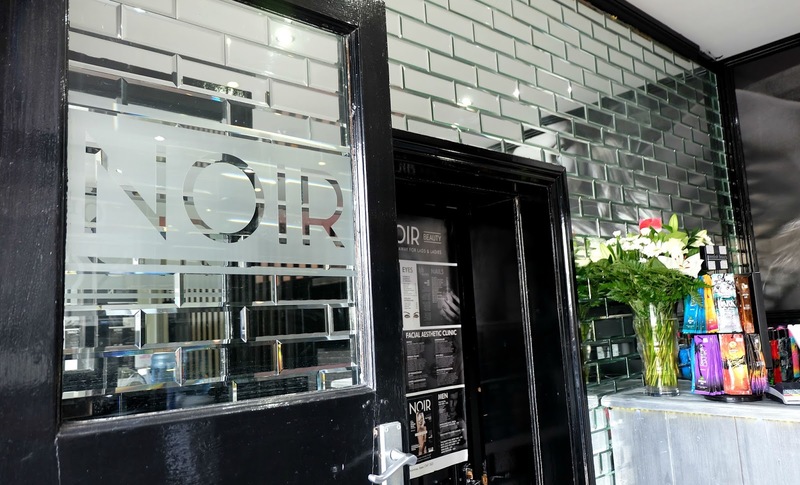 NOIR has just launched its own app on iTunes where you can see their price lists, book appointments and see their special offers which is pretty awesome. They also have a special stamp card where you can collect stamps for a special treat! I hope this has given you a great in sight to some of the treatments I got done at NOIR with that little bit extra info on each! You've made me want to get my eyebrows waxed now! I've never been keen on getting them threaded. I just hate the thought of it! I've never had anyone do anything to my eyebrows. I've always done it myself! Your nails and eyebrows look rad! I think sunbeds are banned in Australia now, because well skin cancer. The salon looks fab and their services seems really worth it. I too recently had the face peel treatment www.cosmedocs.com/treatments/skin-peel-treatment.php and it gave outstanding results with smooth, brightened and glowing skin and I would surely recommend it to everyone.